The teenager’s father that I had met earlier was right: Lake Croche road was great to ride. It was a little more technical than Scotch road I had taken before getting there. The 350 EXC-F, however, made this road pretty easy for the rider – the KTM off-road capabilities are far beyond everything I had ridden so far; its stratospheric ground clearance freed my attention from anything on the road including large rocks on upward slopes – which makes off-road riding an even more satisfying experience. 2:04 p.m. A stop near Lake Croche While I was riding in the area, I saw a small opening in the forest leading to the lake. It was a small access to the lake with an area of about 200 square feet – enough place for a couple of tents. I also saw traces of a camp fire. Camping and moto adventuring is probably something I’ll try in the future. 12:28 p.m. Commuting between Scotch road and Namur. I left Scotch road heading towards the Namur gas station with less than half of the gas tank and about 35 miles (50 kms) to go. I was not too preoccupied, I knew I could do it without running out of gas. So, I left Scotch road, followed Harrington road which becomes the Maskinongé road – this fun road is in major part unpaved. 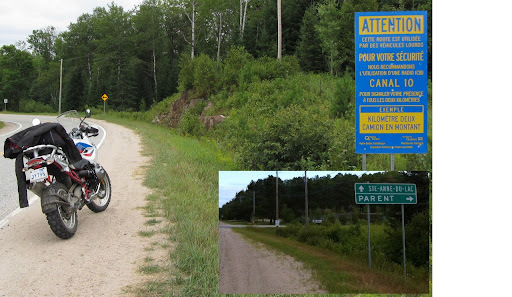 I enjoy this ride which runs along the Red river, crosses quiet rural areas and borders the beautiful Maskinongé Bay.